Chicago (population: 2.8 million) is in northeastern Illinois in eastern Cook County. Lake Michigan, along with the Chicago and Des Plaines Rivers are the main waterways in the city. Interstates 55, 57, 90, & 94 will all lead you to the "Windy City." From what started as a small village in the early 1800’s along the banks of Lake Michigan, Chicago has grown to the nation's third largest city and one of the most famous places in the world, as the result of an ethnically diverse community that adopted the city. 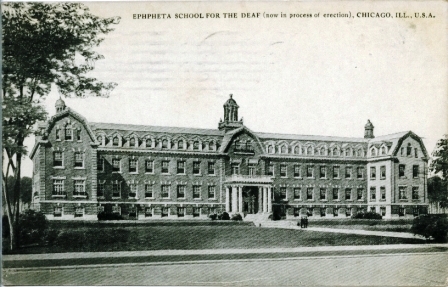 Ephpheta School for the Deaf opened as a day school for grade school-aged students in 1884 by the Rev. Arnold Damen at Holy Family Parish on West 12th Street before moving to the rear of St. Joseph's Home at 1100 South May three years later. Two students were enrolled when the school first opened, increasing to 15 by the end of the year, then nearly doubled to 28 at the end of the second school year. When the school moved to St. Joseph's Home, it also began to accept boarding students. The school was supported by volunteer contributions made to the Ephpheta Society, and operated by the Daughters of the Heart of Mary order. The only requirements for being accepted at the school was be of sound mind and good morals, and no child was turned down due to lack of funds (thanks to the aforementioned society). Ephpheta continued to grow and by 1893 it had 77 students...45 of which lived at the school, which incorporated in 1896. In 1898, it was decided that only female students were allowed to attend because the school was overcrowded. Once new facilities were built at 3100 North Crawford (later renamed Pulaski in 1933) at Belmont on the city's northwest side, males were once again welcomed in 1909. Whether the school actually offered high school course work is inconclusive. according to sources that were contacted. The Archdiocese of Chicago's Joseph Cardinal Bernadin Archives informed us that Ephpheta did offer classes for boys 14 and older that were day students around that time, but the Daughters of the Heart of Mary's archive department tell us that there is no concrete information that the school taught high school classes. But since the school did exist for those of high school age, we have decided to list an entry about this institution. The school's main thrust was to teach their students how to fit in society in the early part of the 20th Century, as boys were taught industrial and trade classes, while girls received training in domestic sciences, millinery, and dress making. We are uncertain of any extra curricular activities for the Ephpheta students. It is believed that the school did not offer any athletic programs that may have competed against other schools in the Chicagoland area. If any one is aware, then please let us know more. We'd like to single out Julie Satzik with the Joseph Cardinal Bernadin Archives and Record Center from the Archdiocese of Chicago for her information, as well as Paula Gaudet with the archives of the Daughters of the Heart of Mary for helping us compile this page.